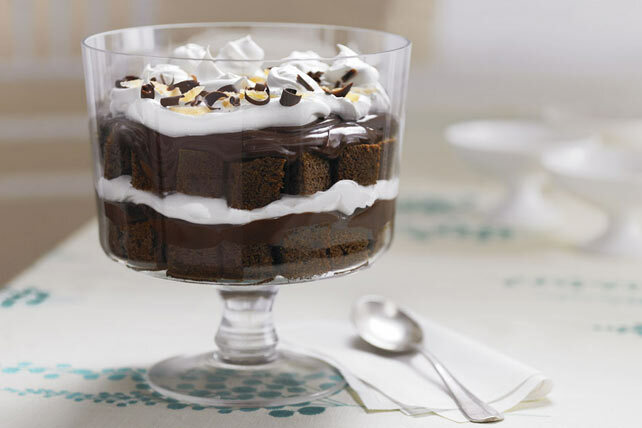 Turn a boxed cake mix into a showstopper of a dessert with our Chocolate Gingerbread Trifle recipe. Made with layers of fresh-baked gingerbread, chocolate pudding and whipped topping, this festive trifle is easy and delicious. Microwave 2 cups milk and 4 oz. chocolate in large microwaveable bowl on MEDIUM 4 min. ; whisk until chocolate is melted and mixture is well blended. Add remaining milk and dry pudding mixes; stir 2 min. Refrigerate 3 hours or until chilled. Meanwhile, prepare cake batter and bake in 9-inch square pan as directed on package for gingerbread cake; cool completely. Cut cake into cubes; place half in 3-L bowl. Cover with layers of half each of the pudding mixture and Cool Whip. Repeat layers of cake and pudding mixture. Drop remaining Cool Whip in dollops over dessert. Refrigerate 6 hours. Meanwhile, make chocolate curls from remaining chocolate square. Add to top of dessert with ginger just before serving. Omit ginger. Substitute 1 cooled 9-inch chocolate cake layer for the gingerbread cake. Trifle can be prepared ahead of time. Refrigerate up to 24 hours before serving. Use vegetable peeler to shave chocolate into curls. Or, use coarse side of box grater to grate the chocolate.